Welcome to the Legion Paper Gallery, where we feature a small collection of artists and designers transforming our papers into works of art. As you can see, our papers are used in a variety of mediums with a multitude of printing techniques. 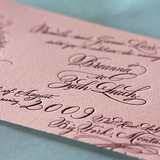 In fact, you'll notice some of the same papers being used for letterpress, drawing, printing and clothing (! ), demonstrating the versatility of our papers. With over 3500 fine art papers to choose from, we're certain we stock a paper to match your needs. Doing something interesting or creative on our papers? Let us know about it and we'll do our best to include it in these galleries or on our blog.